Female Agents , in the original French Les Femmes de l’ombre , is a World War II story, taking place in the last few days before the D-Day invasion of Normandy on June 6, 1944. In late May 1944, in London, Lieutenant Pierre Desfontaines (Julien Boisselier) and his sister Louise Desfontaines (Sophie Marceau) convince three other women to join a task force under Pierre’s command to rescue a British geologist who knows the D-Day plan. He’s been captured and is in a hospital in France. Mild spoilers ahead. Breathe is a film from actress-turned-director Mélanie Laurent ( Inglorious Basterds , Beginnings ). It’s in French with English subtitles and will be released in the US in late September. A taut, nuanced story about the depths of female friendships and the dark side of teenage infatuations, Breathe, the sophomore directorial effort from Mélanie Laurent, is an assured adaptation of the sensational French young adult novel of the same name. Charlie (Joséphine Japy) is seventeen and bored. 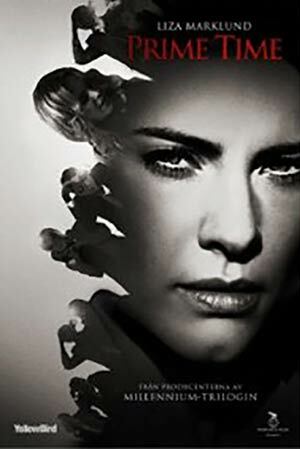 Her estranged parents are too caught up in their own drama to pay her much attention. School holds no surprises either, and Charlie grows tired of her staid friends. Enter Sarah (Lou de Laâge), a confident and charismatic new transfer student who brings with her an alluring air of boldness and danger. The two form an instant connection, and through shared secrets, love interests and holiday getaways their relationship deepens to levels of unspoken intimacy. But with this intimacy comes jealousy and unrealistic expectations, and soon the teens find themselves on a dangerous trajectory toward an inevitable and unforeseen collapse. Isabelle Carré plays Charlie’s mother in Breathe . For readers, a movie tie-in edition of the novel the film is based on will be published by St Martin’s Griffin in September. It is a translation of Anne-Sophie Brasme’s novel written when the author was just seventeen years old. It spent several months as a bestseller in France after its publication in 2001. Dear Frankie is a 2004 film, but just joined the features available on Amazon Instant Video. It was new to me, and thoroughly enjoyable. Emily Mortimer is Lizzie, the mother of 9 year-old Frankie (Jack McElhone). Lizzie’s mother Nell was played with chain-smoking verve by the late Mary Riggans. The three of them have been on the run from Frankie’s father for years. Lizzie and her mother are guarded and restrained and remain that way throughout the film. The film is emotionally charged, but in a vigilant and contained way. Lizzie and her mom are holding it in, but just barely. Let’s start with this infographic from Where’s the Diversity, Hollywood? 85 Years of the Academy Awards from Lee and Low Books. This information is from a study of 85 years of awards and reveals the lack of diversity in the Oscar Awards. We, as consumers, can do something about this lack of diversity. I’ll get to how in a minute. 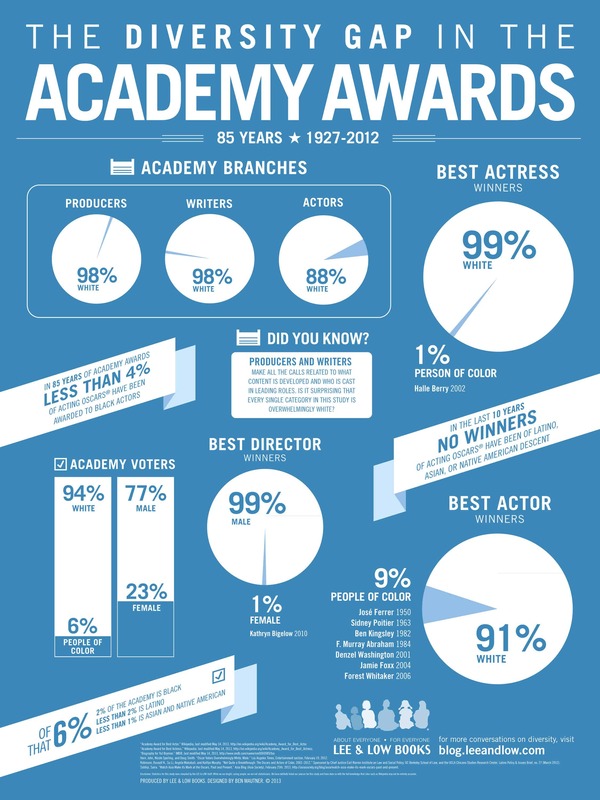 Diversity in the Academy Awards infographic from Lee and Low Books. Click for full size. The article containing this infographic talks how independent films and filmmakers can bring about change in what we see in movies. Four independent filmmakers are interviewed in the article. They talk about what they are doing and how they use crowd sourced fundraising tools like Kickstarter to get films made. The filmmakers interviewed also talk about watching films from other countries in languages other than English. Several people talked about rejecting attempts from directors and writers to create stereotypes rather than more realistic characters. IndieWire picked up the infographic, as I did, and wrote about it The Diversity Gap in the Academy Awards in Infographic Form. This article emphasized that the box office drives which films get made. The situation right now is that when a film with a female lead such as The Hunger Games or Bridesmaids takes the box office the Hollywood power structure is as surprised as Fox News was when President Obama was reelected in 2012. It shouldn’t be a surprise, it should be expected. We, as consumers, are the ones spending the dollars at the box office. We, as consumers, are the ones choosing the channel on the TV or setting the DVR to record. What can we do to increase diversity? Pay attention to Kickstarter or other fund raising campaigns for indie films and support them with a few bucks. It costs you $10 to go out to a movie, $20 if you buy a drink and some popcorn. Why not give that amount to a filmmaker who is struggling to create a film with a more diverse outlook and cast than what you’ll see at the local multiplex? For a while now, I’ve been promoting a Paper.li publication about Women Directors. Perhaps you’ve noticed links to it in my Twitter stream. Many times you’ll find links to fund raising campaigns mentioned in this publication. Start reading it. Support indie filmmakers by watching their work. Sometimes you have to work a bit to find it. It might be shown as a web series or on Vimeo or in only one theater in your town that isn’t the biggest multiplex. Find it and go. Look for stereotypes and stop supporting films and TV shows that support stereotypes. Talk about why you’re doing it on your blog or Twitter. Demand diversity. Make your viewership for movies and TV shows and web series count. Make your eyeballs register numbers and stats in the places where diversity is done right. Use Netflix or Amazon Prime or Hulu to watch foreign films of quality. There are plenty of them. You can read. Use that skill to read subtitles and you’ll see some amazing stories. Lee and Low Books have done similar studies of The Tony Awards, The Emmy Awards, the children’s book industry, The New York Times Top 10 Bestseller List, and US politics. Thanks to them for organizing this information and making accessible visuals to help us understand the stats.
. . . gives films points for representations of people which avoid harmful and limiting stereotypes, as well as for having diversity behind-the-camera. There are 27 possible points in the test, but any film scoring 11 or above receives an “A” for representation. Downloading and using this test, and talking about your scores in public places such as your blog and Twitter is another good way that you as a consumer can help change the status quo. You may want to to check back for new versions of the test from time to time, because the creators say it will evolve over time. Image credit: Diversity Quilt via Flickr. I often have a problem with films when the faces are unfamiliar. This applies to an awful lot of indie films I see. The problem is that I have trouble keeping track of who the characters are and what their contribution to the story is because I don’t recognize the faces. It makes it hard for me to keep everyone organized in my head. I don’t blame this on the filmmakers or on the stories they are telling. It’s probably some brain glitch on my part that takes me a while to learn to distinguish faces. Slow synapses or some such. Last night I watched a movie that had a whole lot of female characters. (How unusual for me!) Only the main character was an actress I’d seen and heard of before. And her face only looked identifiable from certain angles, because I hadn’t seen a lot of her. I couldn’t keep her interactions with all the other characters sorted because I had trouble remembering who everyone was. It’s not like watching August: Osage County, where every person on the screen is someone I’d seen dozens of times before. The particular indie I saw last night was a good movie about a marriage gone stale, and I wanted to get more out of it. I found a solution. I watched the film twice. The second time through I had better luck keeping track of who was who and what their particular part of the story meant in the overall scheme of things. Now that I’ve discovered this trick, I will used it again on indie films with cast members I might not know so well (yet) and on foreign films with unfamiliar actors, too. Do you have a trick for keeping the characters organized in your head when the faces are all unfamiliar to you?